‘The government wants more homes to be built, but there simply aren’t enough bricklayers to get the work done. 21 November 2017, York – Mitchell & Urwin Stone & Brickwork, a family-run Yorkshire-based building company working for the UK’s largest house builders, has beaten over 4,000 other construction businesses across the UK to win the CITB Apprentice SME Employer Award 2017. The award, presented by BBC’s Steph McGovern in London on November 9th, recognises the exceptional efforts the company has made in recruiting and training fresh talent into the building profession to help plug the skills gap. 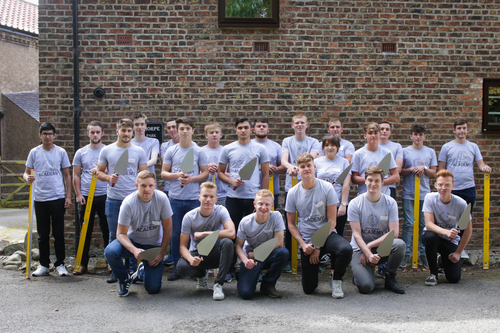 Mitchell & Urwin has invested significantly in its Apprentice Academy by taking on 49 apprentices in the last three years. This means 25% of its bricklaying workforce are apprentices, while 10% of the site workforce act as mentors to the young recruits after receiving CITB training on how on to coach and inspire young people. The company has appointed an Academy HR Manager to oversee the programme and it recently recruited its first female bricklaying apprentice, unusual in an industry where 99% of the workforce is male. Founder Richard Urwin, who started out as a bricklayer aged 17, felt that something had to be done to ensure there are enough well trained bricklayers to meet the growing industry demand. ‘The government wants more homes to be built, but there simply aren’t enough bricklayers to get the work done. The construction industry has an aging workforce and many young people are put off by the stigma of pursuing a trade, instead of going to university,’ Richard explains. Richard believes that the industry should be doing more to encourage apprentices into the trade and that more government-funded grants should be available to companies who are trying to reduce the skills shortage. ‘We are getting some financial help from CITB grants and from our clients and we’ll be looking to expand on this. We’d like to see similar commitment from others in the industry. We’re really proud of what the team has achieved to date and intend to grow the programme, employing local labour, to build local homes, for local communities,’ he says. The success of Mitchell & Urwin’s Apprentice Academy came to the CITB’s attention after one of its representatives visited a construction site in Hull. Two of the apprentices raved about the support they were receiving from the company. As a result, Mitchell & Urwin was one of just 25 shortlisted companies from across Great Britain put forward for consideration for the award. Mitchell & Urwin was founded in 1996 by Richard Urwin and his then partner Adrian Mitchell, who left the business in 2003. Richard started life as a bricklayer aged 17 and has gone on to build Yorkshire’s most successful family-run brick building company, serving the UK’s leading housebuilders. It has its own specialist stone and brickyard where it makes products that are shipped nationwide. Richard now runs the business with his wife Susan, with a core team of employees and an extensive network of dedicated on site sub-contractors. Go to www.mitchellandurwin.com for more information. CITB is the Industrial Training Board (ITB) for the construction industry in Great Britain (Scotland, England and Wales). CITB uses its research and labour market intelligence to understand the sector’s skills needs, and works with industry and government to make sure construction has the right skills, now and for the future. CITB is modernising its funding approach to invest in areas that will deliver the best returns for industry, and enable the sector to attract and train talented people to build a better Britain. This press release was distributed by ResponseSource Press Release Wire on behalf of Campfire Communications in the following categories: Business & Finance, Education & Human Resources, Construction & Property, for more information visit https://pressreleasewire.responsesource.com/about.